This guide forms part of a series to help institutions think about how they might scale up online learning. It outlines choices around curriculum design and what support staff and students may need. Technology and tools for online learning focuses on the implications of technology choices on staff and students. Which pedagogic models are most appropriate for your specific online learning needs? Which technologies support the different pedagogic approaches? Various educational models and theories can inform curriculum design. Course design teams may engage deeply with particular models or may find those which suit their subject discipline well. Some models or educational approaches suit the use of specific types of technologies. This guide considers how some models or theoretical approaches work in an online learning context – although it’s not intended to be an extensive list. Communities of practice: a conceptual framework (Wenger-Trayner, Beverley). Your institution can help staff by considering how different pedagogic approaches align with strategy and how students might benefit. It can also identify which technologies or tools support particular approaches, and make sure it establishes appropriate operational and administrative functions to support the institutional business model. These approaches to learning incorporate activities that promote learning within an authentic context and culture or community. It is especially relevant for courses that lead to particular professional qualifications. Problem, project or inquiry-based learning fit well into situated learning contexts. The learning experience attempts to replicate what it feels like to deal with authentic real-life tasks. For example, online courses can offer students an opportunity to experience what it’s like to work across distributed global teams within their chosen profession. Distance learning students can integrate their studies into their work situation, and may use project assignments to investigate real issues in their own workplace. Nottingham Trent University1 helped students to develop digital confidence through authentic tasks for campus-based students using online activities. The University of Liverpool2 integrated digital literacy with enquiry-based learning. Their case study shows an interesting collaboration between an academic team and library service. These include activities that promote learning through social interaction. By using online social networking technologies, your institution can incorporate collaborative activities that encourage students to interact and work together. Students can work with others on the course, alumni or with open participants to learn and to produce collaborative content. Your institution can also provide opportunities for students to work collaboratively with professionals online, and support them to have authentic, real-life interactions. Some students may find it very challenging to work collaboratively online. Your institution will need to ensure that all learners have the technical and communication skills needed to get the most out of their learning. More importantly, students need to understand the benefits of working this way. Your institution will need to help them to develop trust in each other and staff, to learn effectively with people they have not met face-to-face. Our technology and tools for online learning guide considers a wide range of tools that can help students interact with each other online. Students with autism may find this way of working particularly challenging and may need more support, although they may prefer to collaborate online rather than face-to-face. It may be difficult for staff to assess contributions with collaborative approaches, so your institution may need to identify ways to track and measure interactions. Students need clear guidance on how to record and show their collaboration. For example, if students produce a collaborative wiki page, they can identify their contributions in some way, or the teacher can use automated tracking mechanisms to find out who has logged on and edited a page. Our guides on collaborative online tools and crowdsourcing - the wiki way of working offer some ideas for incorporating collaborative approaches. Can you adopt strategies from gaming (‘gamification’) within your courses? What are the implications of adopting games-based learning? What operational, technical and administrative changes are needed? Digital games are usually designed for profit and fun, but there’s increasing interest in their use for non-entertainment purposes, particularly in education and training. Terminology in this field can be confusing so you may find an explanation helpful. The use of game approaches for online learning can help to reinforce or develop skills, or provide a forum for experimentation and discovery, however your institution may find that incorporating such approaches can be costly if staff don’t have the necessary technical skills. Our accompanying technology and tools for online learning guide includes a section on gaming technologies and gives examples of use in an educational context. Although technological developments increasingly make gaming easier to adopt, there are several cultural barriers that affect choices around using games within the curriculum. In their book1 on enhancing teaching and learning through games Nicola Whitton and Alex Moseley identify barriers for students and staff. Students may feel that the use of games for serious study isn’t appropriate or too frivolous. Staff may find it challenging to convince senior managers or peers of the value that games could add to the curriculum. Even when staff are open to using gaming approaches, they may find it difficult to map them into their specific curriculum. Gaming can support behaviourist approaches to encourage repetition, recognition and recall but has significant strengths for constructivist approaches. Gaming in education can support high-level learning outcomes such as critical thinking, synthesis, evaluation and problem-solving. It can also encourage experiential learning and inquiry-based learning by incorporating authentic gaming experiences that allow students to try out different actions that would be difficult in real environments. For example, in a medical context, it may help students to diagnose conditions, and see the impacts of their decisions, without harming real patients. Gaming can also support collaborative learning approaches. Multi-user roleplaying games offer opportunities for players to work in teams, and develop communities and rules to support the achievement of the game’s aims. Educational games can offer similar collaborative opportunities for online students to interact and complete cooperative tasks. Issue 43 of the online journal eLearning Papers explores different approaches and models for applied games and gamified apps. Our guide to digital games in learning offers more information and links to studies and research in this area. How will adopting an open course benefit your students or institution? Can some parts of your existing courses benefit from being made open? Which open licences should you use for our course content? Your institution may have identified demand for open courses from market research or may have decided that open courses are an appropriate business model. The rise of high-profile MOOCs and the development of the UK Futurelearn platform have resulted in many institutions developing open courses. Our blog post on MOOCs and open courses describes some of the different kinds of open course models. xMOOC courses can be attractive as an online learning proposition as they are high profile, present existing content such as lectures via videos, and require minimum staff input on discussion forums. Although expensive to set up initially, they can be re-run at a much lower cost. They also tend not to disrupt existing courses, and can be a way to promote certain educators and their 'paid for' courses. Not all open courses follow the xMOOC model described above, and there are alternatives that focus on connectivist principles. Not all open courses are 'massive', and there are smaller scale collaborative open courses. Some of these open courses are aimed at educators and offer an opportunity to consider and discuss new and different pedagogies with peers around the world. They also provide an experience of being an open online student. Two recent examples of this are Connected Courses and the Flexible – Open – Social Learning (FOS) course. Examples of open online classes for undergraduates include a digital storytelling course known as 'ds106' at the University of Mary Washington in the US and the open media classes at the University of Coventry. Both of these courses adopt a connectivist approach for an open online experience that augments a traditional face-to-face course. They have had significant interest from education professionals all over the world, who have emulated and adopted this approach in all kinds of institutions. The Coventry open classes had such a positive impact that the university has since developed a fully open online masters course. Working collaboratively as a principle supported by reconfigurable working spaces, technologies and teaching approaches. Your institution might have adopted open approaches to developing content, such as open educational resources (OER), or may have some elements of openness in online classes. If your institution plans to incorporate open online approaches, it will need to engage staff in the benefits and make sure that it provides appropriate training and support. Our technology and tools for online learning guide considers technological aspects of open learning. Which activities are affected when designing online learning? What institutional systems and services need to change? Your institution will benefit from taking an institution-wide approach to curriculum design, to allow different departments and services to have appropriate input. While course teams will have knowledge and experience of the best pedagogic approaches for their subject area, it’s helpful to include student support teams and technical teams too, so they can support the choices made. Course teams will need input from other departments for technological and content development, and to create student support mechanisms. There are a few areas that may need particular attention if the curriculum is being redesigned for an online learning context. Your institution may be able to use existing content for a redesigned or new curriculum, but may need to develop content for online learning courses or classes from scratch. Staff may want to take a new approach to creating content, using or adapting open content made by other educators, or get students to develop content as part of learning activities. They may need help to create new and different formats for existing content, to make them more accessible or more engaging online. Teaching staff may want to use existing institutional content management systems, or may prefer to use cloud services to store and present content. Decisions like this have implications for the management, curation and long-term sustainability of content. Online learning content can also present challenges around ownership, tracking and archiving. For example, staff will need to consider what kind of licences to use and will need to educate students and external participants about this. Using open licences can make your institution's resources available for others to use and, if branded well, can be a useful marketing tool. Our open educational resources (OERs) guide considers the institutional and cultural aspects of producing and using open content for learning. What support do your online students need that is different from campus-based students? How can you involve students as co-creators? How do you provide online learning students with institutional support? Online learning students need new support mechanisms, and different ones to campus-based learners. Your institution may find it challenging to meet these different needs while still maintaining an equitable service for both groups of students. However, campus-based students may sometimes also be online students. While they will sometimes need the same support, how an institution provides this support may vary considerably. It’s likely that support will be required outside normal working hours, and will have to be offered using online technologies rather than in person. Online learning also creates new support needs. Even something as straightforward as accessing the same online sources may require very different procedures for those accessing off campus. It's important that online students feel well connected to teaching staff and other students. If they're not encouraged to feel part of your institution, they may drop out. Well-designed course activities can make them feel involved, but it’s useful to provide additional online social spaces, such as dedicated discussion forums or regular live chat sessions, to encourage interaction. This also provides an opportunity for students to feed back about the course and their learning experience. Regular communication with students by email or text can help maintain links with them and encourage them to participate in virtual institutional activities. Your institution will already offer campus-based student support services from various departments and buildings. As technologies are introduced, it’s likely that some services will be duplicated as the roles and boundaries between departments become less clear. Seemingly straightforward requirements, such as managing and updating student records, can present problems where departments operate different administrative and database systems. Online students can be put at a disadvantage if administrative systems do not link up. There needs to be some way of recording if a student accesses support, and ensuring that either their needs are met or they are referred to other support. A teacher may have no information about which support mechanisms a campus-based student has accessed, but this may be different for online students. Your institution should adopt a coherent approach to make sure online students have equitable access to all kinds of support: learning, technical, administrative and pastoral. Teaching staff tend to be on the front line of online student support as they may be the first point of contact. If there aren’t appropriate mechanisms to provide online support, students may have to rely on teaching staff or other students for support. This will place an extra burden on teaching staff, and learners might not get the support they should have. Students need help with technical and digital skills to become active learners online but also need support to develop confidence as an independent and lifelong learners. It’s highly likely that they will need to be competent online communicators in their future professional lives, working collaboratively and sharing content and ideas. Students can become co-creators of learning activity design, content development and curation, assessment banks, peer review and feedback. By including students in this way, your institution can help them become creative and innovative professionals. It’s feasible for students to develop a professional digital presence, networks, portfolios and even businesses during their course; these enable them to explore possible future pathways and leave the institution with a strong professional identity. What do you need to change to support online students in their learning? Online students need different learning support to campus-based learners. They are likely to be part-time and accessing learning outside normal office hours. They may already be effective self-directed learners who need little direction or structure, but may not have had previous online learning experience. They may be able to use a range of technologies to support their learning, but your institution can’t assume this. Online learners may require support to learn in English if it’s not their first language. When students register for online courses, they need clear advice and guidance on the technologies that they will need to use – your institution may need to offer introductory modules or sessions on getting the best out of online learning. Your institution should design courses with the differing needs of online students in mind, making sure that technologies are accessible and easy to use, that assessments are designed appropriately, and that students have a clear understanding and capacity to learn online. An updated enhancing the student digital experience guide, with new FE content and case studies. What can students offer as co-creators and partners? How will you engage online students as partners? At Jisc, we’re committed to working with institutions to develop new partnerships with students, and ensure the design and delivery of curriculum respond to what learners need and expect. We have also developed a network for staff and students working in partnership to support curriculum enhancement and innovation. Providing feedback to other learners. Student-to-student support is particularly important for online learning when staff or institutional support mechanisms may not be immediately accessible. Students may use discussion forums to ask questions, or develop support groups on social media such as Facebook or Twitter. Your institution will probably have a policy, or group of staff, to develop and maintain good relationships with alumni. Online learning presents an excellent opportunity to engage with alumni and to find out how they are progressing in their careers. Alumni can offer a unique perspective to current students on what it is like to make the transition from studying to work. They can also provide feedback about which aspects of the course were most useful and relevant, and which may need adapting or improving. Alumni can support students online by participating in learning activities or offering feedback to students. Your institution may be able to pay them to take on support roles that it cannot cover with existing institutional resources, which can be very helpful for out-of-hours support. There are many benefits to maintaining relationships with alumni and making the most of their unique perspective; our relationship management guide includes examples of institutions working with alumni as partners. If staff receive appropriate support and have time to adapt, this can be a real opportunity to develop and improve. Your institution will need to provide training to fill any gaps in their knowledge or skills, and should also link online learning activities to performance review mechanisms. Many staff feel underprepared to use technology for learning, and that they are often not rewarded for their experimentation. As a result key priorities for colleges are likely to be proactively engaging learners; supporting staff to use technology for learning, and publicly rewarding staff. The report also highlights that sector bodies should play a role in incorporating the use of technology for teaching and learning. One way to achieve this is through skills frameworks. The UK Professional Standards Framework (UKPSF) includes innovation and creativity in one of its five areas of activity. As a skills framework for higher education teaching staff, this provides a useful mechanism to address staff development in online learning. The Education and Training Foundation's professional standards handbook1 also includes creativity and innovation in their six professional values and attitudes. While neither framework is specific to online learning, staff could usefully refer to them when enhancing their teaching practice with online learning. Our building digital capabilities work identifies a range of activities that focus on staff capability for new digital leadership, pedagogy and efficiency. This work draws on a review of skills frameworks, which identified national, professional, institutional and international frameworks for a range of different roles in educational institutions. These include frameworks for learning and teaching, ICT, information, digital and media literacy, administration, leadership and careers. 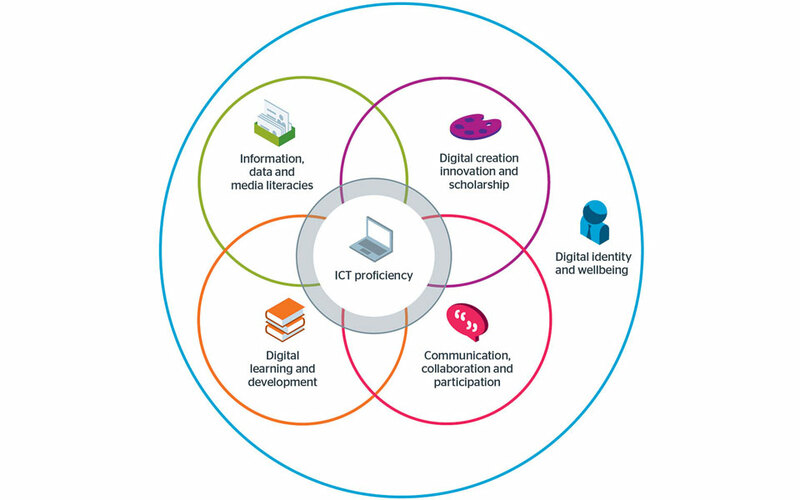 This interprets digital literacies in a broad sense, and the resulting digital capabilities framework aims to draw all of those elements together. Your institution should include online learning capabilities in continuing professional development (CPD) mechanisms. Formally acknowledging the need for new skills shows this is an important activity, aligned with institutional strategy. It also demonstrates that your institution is willing to commit time and resources to help staff build their skills and competencies in this area. This kind of approach can be helpful for staff, who may be feeling threatened or concerned about how this will affect their jobs and working practices. Our guide, digitally enable your team to improve learner engagement, offers a useful starting point and focuses on the change management aspects. While this does link with generic digital capability building for all staff, online learning needs addressing specifically as it may require different digital skills. It can be useful to carry out a digital capacity audit to evaluate how confident staff are in using technologies, and how they might adapt these to support their work. For online learning, this may need an additional element to find out if they understand the difference between adopting new technology and implementing a coherent new model for teaching and learning. There are courses available to support staff development in online learning. It can be particularly useful for staff to attend online courses to experience what it feels like to be an online student. Some courses such as the developing digital leaders course offered by Oxford Brookes University1 focus on specific aspects of practice, but there are masters and postgraduate certificate in education (PGCE) courses with a broader online learning element. Adopting online learning on a large or small scale provides an excellent opportunity to re-consider your course design. Your institution may find new ways to use technologies to engage students, maintain ongoing relationships and enhance feedback and assessment. It also presents an ideal mechanism for course teams to consider and adopt different pedagogical approaches. Your students will need different kinds of support when learning online and adopting an institution-wide approach to this is important. In addition to teaching support at a distance, online students need appropriate technical and pastoral support. We recommend you reading our companion guide, scaling up online learning, which offers a strategic and operational view of implementing online learning. Our accompanying guide on technology and tools for online learrning takes you through the choices you need to make around selecting and using technologies. It also offers examples from a range of educational institutions that may inspire you.